It has been reported that politicians across Europe are glued to their TV screens watching the disaster movie unfolding in Westminster. "It is better than anything on Netflix", one former Polish president declared. A more common reaction of working-class people in Britain is to turn off the telly in anger and despair at the latest twist in the seemingly never-ending Brexit drama. It is now a decade since the MPs expenses scandal erupted. Fury at MPs who represented the interests of the capitalist elite - while dipping their snouts in the expenses trough - has been enormously deepened by what followed: bank bailouts and growing wealth for a few at the top, combined with wage restraint and brutal austerity for the majority. At root, the working-class vote for Brexit in 2016 was a cry of rage at the misery of the previous years. Now the farcical deadlock in parliament is once again fuelling a bitter mood of anger at the Westminster politicians. Latest polls show 39% of people blaming the Tory government for the mess, and another 39% blaming all the MPs. Theresa May is flying around Europe, trying to get agreement on an extension to Article 50 until the end of June. If no extension is agreed by Friday and no withdrawal agreement passed, then a chaotic 'no-deal' Brexit would take place. This would inevitably result in economic dislocation for which the capitalist class would try to make working-class people pay. French President Macron has threatened to offer only a very short extension to 'prepare the markets' for such a scenario. The workers' movement also urgently needs to prepare. Measures would include the trade unions and Jeremy Corbyn demanding that customs and border staff are given the authority to ensure essential supplies are delivered over luxury goods. The trade unions should organise to fight to prevent workers being asked to pay for the crisis via unpaid overtime and increased workload. Companies threatening job losses should be made to open their books for inspection by elected trade union representatives and, where necessary, nationalisation under democratic workers' control and management. While a chaotic Brexit is a real possibility, the majority of the EU's capitalist classes would rather avoid it, with its very disruptive consequences. It is more likely that they will agree to some form of extension, but insist that it is for longer than May is demanding. She is justifying her short extension by arguing that the negotiations with Labour are likely to lead to a compromise proposal, but reports from both sides of the talks seem to indicate that she is deliberately exaggerating her prospects of success in order to try and keep the show on the road. The Tory party was once one of the most successful capitalist parties on the planet, capable of long term strategic planning. Now, reflecting the crisis of British capitalism, May is reduced to stumbling from hour to hour - if not minute to minute - with no strategic goal other than preventing the complete implosion of her party for another day. All her limited options, however, will lead to a further fracturing of the Conservative Party. A deal with Corbyn would outrage swathes of the Tories who, like Boris Johnson, denounce him as a 'Marxist'. So, however, would a longer extension of Article 50. Accepting a 'no-deal', chaotic Brexit would please the Tory right, but horrify the Remainer wing of the party and, more importantly, the vast majority of the capitalist class. Given the intractable character of the deadlock, a Tory leadership contest followed by a general election, or even a snap election with May still as leader trying to push her deal through, could be on the agenda. As millions of people across Britain despair at these parliamentary machinations, it feels a very long time since the snap election of 2017. Yet May's difficulties in part stem from her lack of a parliamentary majority as a result of the surge in support for Jeremy Corbyn's Labour in that election. Over 3.5 million more people voted Labour in 2017 than in 2015 - including one million who had previously voted Ukip. They were enthused by Corbyn's election manifesto which they saw as standing for the working-class majority rather than the billionaires. Unfortunately, that enthusiasm has now dimmed considerably. 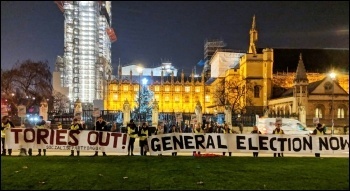 Corbyn and the left Labour leadership are not conveying a clear message to working-class voters above the parliamentary hubbub of the different strands of capitalist politicians. A central reason for this is their continued mistaken attempts to compromise with the pro-capitalist Blairite wing of Labour. Corbyn's approach to the talks with May, for example, should have been to forcefully declare his own red lines - demanding the repeal of all anti-trade union legislation and all neoliberal pro-privatisation rules, for example, and refusing to countenance any deal which did not include agreement on these and other pro-working class measures. Instead, Labour sources around the Blairite shadow Brexit secretary Keir Starmer are reporting that they have shown their willingness to compromise by retreating on their opposition to the EU's pro-privatisation and anti-state aid rules. 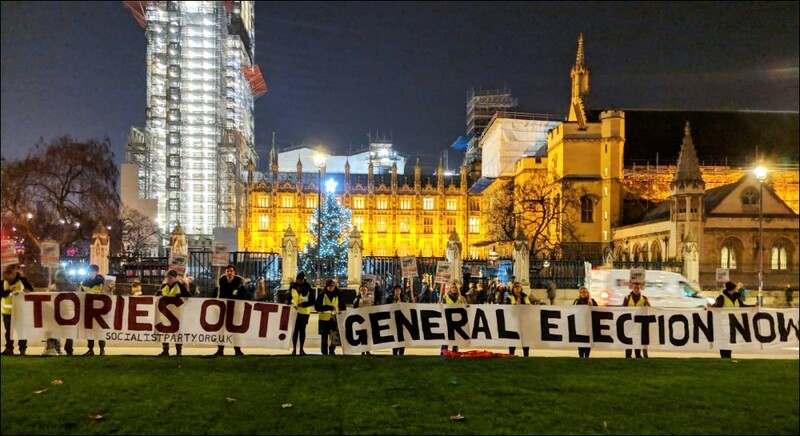 If a general election takes place, Corbyn will have an opportunity to repeat the 2017 election on a higher level, mobilising the accumulated anger of the majority at the existing order, and sweeping the Tories out of power. This is not guaranteed, however. Inevitably the Tories would try to portray him as 'betraying the Brexit vote' and this could have an effect on sections of working-class voters. Preventing this is not primarily a question of what 'clever' parliamentary manoeuvres he conducts, but the need to urgently go beyond Westminster and to launch a mass struggle, together with the trade unions, for a general election and the coming to power of a Corbyn-led government with a socialist programme. Such a programme could use the 2017 programme as a starting point but would also include, for example, reversing all cuts to council services, scrapping Universal Credit, and a pledge to nationalise Honda Swindon under democratic working-class control, along with any other companies who carry out closures and job cuts in the name of Brexit or otherwise. This should be combined with nationalisation of the major corporations and banks to take the levers of power out of the hands of the capitalists, who will inevitably attempt to sabotage a Corbyn government. Linked with a manifesto for a socialist Brexit, this approach would be able to enthuse the working class in Britain - both those who voted leave and remain - and make a very effective call for international solidarity with workers across Europe.